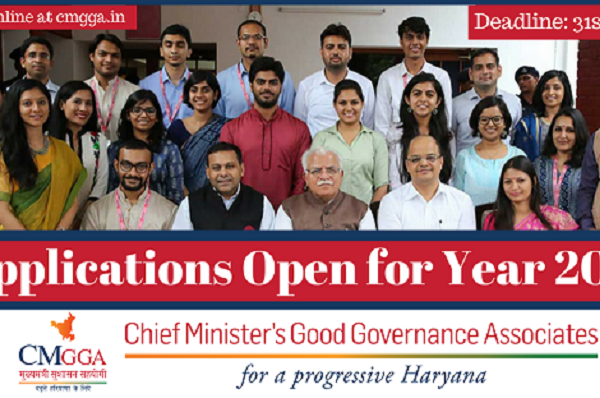 Advertisement for the Haryana CM's fellowship. It was in 2009 when Narendra Modi was the CM of Gujarat that he launched the Chief Minister’s Fellowship Programme as an “extraordinary opportunity for the youth to be part of social service for the future development of our country”. Fellows were attached to high-profile projects to make an “exceptional impact on social development”. The Modi model has now firmly caught on, especially with the BJP chief ministers. Chhattisgarh is just about to wrap up the selection of 42 young fellows who will work with every district collector in the state. Among the contenders are students from IITs, IIMs and Ivy League institutions. The Maharashtra government last month announced the selection of 50 youngsters for the CM’s fellowship programme. Haryana’s Good Governance Associates are in place, so are the fellows in Madhya Pradesh and Gujarat. The CMs are looking for no one but the best, setting aside neat budgets to draw the young and talented. The Chhattisgarh CM’s fellowship programme has created quite a flutter, with a rather competitive stipend on offer ranging from Rs 1.5 lakh to 2.5 lakh per month. Alex Paul Menon, CEO of the Chhattisgarh Infotech Promotion Society (CHiPS), which is driving the fellowship programme, told ThePrint that the state had received near 3,500 applications for the 42 fellowship positions. “We have applications from about 80 international candidates from top notch universities like Harvard, Carnegie, London School of Economics. Over 1,000 candidates are from prominent Indian institutions. We are quite enthused by such a good response,” Menon told ThePrint. “Our aim is to bring greater professionalism and new skills in the administrative and scheme delivery system and we feel that young talent is key to it. We understand the value of the skills young professionals can bring in and therefore decided to offer a good financial package to draw the best candidates to help us usher in real reform in the system,” he said. The fellows—under 35 years of age—will be deployed across the 27 district collectors’ offices, in various departments besides the CMO and the chief secretary’s office. Their job will be to identify the bottlenecks in policy implementation and design strategies for improving it and bringing greater convergence. In Maharashtra, CM Devendra Fadnavis has set the age bar even lower. His government has selected 50 candidates—all under 26—who will be paid about Rs 80,000 per month for the 11-month programme that is designed “to cultivate young leaders, strengthen their understanding of the public administration and prepare them for greater leadership roles in future”. In Haryana, the Khattar government has collaborated with Ashoka University to train and facilitate “the most promising and passionate young men and women of the country to work with the state machinery and tackle some of the complexities that face the country today”. The ‘associates’, after training, are posted in each of the 22 districts of Haryana for 12 months during which they represent the CMO and work closely with the DCs and district officials. Associates get a chance to interact regularly with the chief minister, directly present their work and recommendations to him as well as drive impact at the highest and lowest levels of the government. They will be paid Rs 50,000 per month. The other BJP-ruled state, Madhya Pradesh, now brings in 51 research associates under the Young Professionals for Development Programme. They are placed in each district of Madhya Pradesh to gather feedback on the functioning of the government, are guided in their work by dedicated mentors or advisers and work closely with various departments in making policy. While the research associates will receive a remuneration of Rs 40,000 each, the advisers will earn Rs 60,000 per month besides HRA. The state has set aside a budget of Rs 11.2 crore for this programme. The outreach to the young professional is not limited to BJP states. Kerala recently announced setting up of a six member-committee of the ‘Chief Minister’s Fellows’, to help the CM on IT-related issues. Candidates under 40, and with two years’ work experience, will be considered for the job. After a two-year stint they will be considered for deployment in public sector institutions, flagship projects or the CM’s office. In Delhi, Arvind Kejriwal had announced the Chief Minister’s Urban Leaders Fellowship (CMULF) programme for those in the age-bracket of 21-35, with a competitive remuneration—up to Rs 1.25 lakh per month, depending on their academic, professional and work experience. Andhra Pradesh CM Chandrababu Naidu has been hiring ‘Chief Minister Fellows’ from the Indian School of Business (ISB) to develop strategies that can enable the state to become the best in the country by the year 2029. Jairam Ramesh, rural development minister in the UPA government, went on to start the Prime Minister’s Rural Development Fellows (PMRDF) to ensure development in Naxal-hit areas. The scheme continues and will probably be revised for improving its effectiveness.